Almond Terminology: Almond Colour and the ‘Break’. Almond is a traditional standard coloration. On a brown-yellow (almond colour) body black splashes, sprinkles or flecks are shown. Primaries and tail feathers have as possible the three colours brown-yellow, white and black, thus tri-coloured. In German language ‘Musterfedern’, standard feathers. In reality this will not apply to all feathers, but only for a part. In the matter, the experts agree, there is however some dispute about the correct terminology. 'Well broken' is a term that Fulton used in 1876 in his influential portrayal of the Almond Tumbler. The colour flow on the feather is ‘broken’, different colours at the same feather side by side, the German ‘Musterfedern’. The three colours should appear clearly demarcated from each other on the primaries and on the tail feathers, and above all the initially scarcely black, or the dark kite bronze, on the primaries and tail feathers next to white and almond should not be missing. What is the 'Break', that was the question in a recent controversy. Is it the white or almost white parts in the wings and tail, which are not reached by colour due to the temporary interruption of the pigment supply during feathering, or are they the coloured flecks? All the emotions, the first ones dealing with almond, did not need an answer. The 'break' in a material realization did not interest anyone in the older literature and no one missed it either. It is a process of colour formation, which in some individuals in some feather parts results in a tri-coloured plumage. To come back to Fulton. ‘Well broken’ is the term Fulton 1876 used, especially in the discussion of proper hens. “The class of hens that are well broken in feathers are those, which … show both yellow and white, with some signs of black in their flight. If these feathers … show some signs of break of feather, the fancier may in due time expect a good hen; …”. We may conclude that ‘break’ is not associated to a specific colour, but to the existence of all three colours at a feather side by side. Some statements about the chronology is useful. It is not 300 years back that Fulton argued about the correct almond colour, as was stated in a comment. It is about 140 years. And Fulton also was not criticised by Moore because Moore still died in 1737, far before Fulton published his book. Also Hollander took the question, what is a break, 'obviously different than expected in the discussion. The answer in a fictional interview, variegation, flecking, can be interpreted as sprinkled or stippled, as the terminology at Wriedt and Christie in 1925 at the first genetic analysis of the stipper factor St. Interesting yet another interpretation of 'Break'. For Eaton 1851 it was the contrast between the almond-coloured body and the black patches found on it. Back to Fulton, he assumed that those Almonds with some more black intermingled in the primaries and tail feathers from the beginning on will also be those that become well spangled at the body. For the appearance of an almond it was certainly as important a question as the tri-coloured tail feathers and primaries. For those interested in the past of races, looking at the German language book ‘Taubenrassen', which chronologically represents the essential works of literature, would certainly be helpful. Davis, Kenny (Co-ordinator of the Almondated Special), The Color Almond, Pigeon Debut February 2002. Eaton, John Matthews, A Treatise on the Art of Breeding and Managing the Almond Tumbler, London 1851. Fulton, Robert, The Illustrated Book of Pigeons, London u.a. 1876. Hollander, W.F., Origins and Excursions in Pigeon Genetics, Burrton 1983. Moore, J., Pigeon-House. Columbarium: or the pigeon house, London 1735. 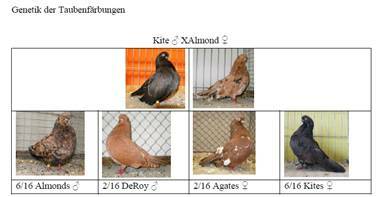 Sell, Axel, Pigeon Genetics. 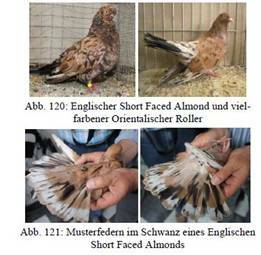 Applied Genetics in the Domestic Pigeon. Wriedt, C., und W. Christie, Zur Genetik der gesprenkelten Haustaube. Zeitschrift für induktive Abstammungs- und Vererbungslehre 38 (1925), S. 271-306.